Axum is the ancient capital of the old Ethiopian civilization which held sway from the 4th century BC to the the 10th AD. It is a city full of monuments, specially the stelae which are numerous in numbers and vary in size. 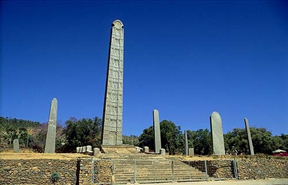 These stelae are believed to mark the sites in Axum.The tallest one, which is believed to have fallen down during construction, is 33 meters high, 3.84 wide and 2.35 meters deep, and weighs 520 tones. The Italian Fascist army removed one of these stelae, weighing 170 tones and with a length of 24.6 meters, during the occupation of Ethiopia and installed in Rome. However, it was returned and re-installed on July 31, 2008. Axum flourished as a trading centre at a time when the Red Sea was a vital thoroughfare linking the Roman Empire with Afrcna, Arabia and the even more distant civilizations of India and China. Axumites have been exporting local products such as ivory, tortoise shells, hippopotamus hide, spices, incense, gold, obsidian, and other precious stones, and slaves. In return, they buy manufactured goods from outside such as iron weapons, glass ware, cloth, garments, pottery and wine. From about 270 AD onwards, Axum also started minting coins. Coinage, as well as encouraging the exchange of productions, made the collection of taxes more convenient. Coins made of gold, silver and bronze, and carrying the name of the ruler in whose name they were issued are important tools of historical analysis. With the rise of Islam in the 7th century, the decline of Axum began. Initially, Axum played an important role in the rise of Islam by providing refuge to the followers of the prophet Mohammed who were being persecuted by the lords of Arabia. These lords opposed the foundation of the new religion. Ethiopia is, thus, the first country outside of Arabia where Muslims settled and were protected from persecution. In Islamic tradition, Ethiopia is known as the land of the first Hijra. Subsequently, however, the rising power of Islam led to the decline of Axum. But, for having provided refuge to the early persecuted Muslims, Ethiopia was made an exception by the prophet Mohammed to the sweeping rule of Islamic conquest. Ethiopia was to be left alone, unless it itself declared war on Islam. This has led to the situation today where Ethiopia is the only country in the Islamic region with a slight Christian majority. The introduction of Christianity in Ethiopia goes a few hundred years earlier. This became official in the early 300s when the Axumite kingdom was at the height of its powers under king Ezana. Ezana's conversion and the adoption of Christianity at the level of the state make Ethiopia the second Christian state in the world After Armenia. Legend and history portray Ethiopia as the only country in the world where the three religions of Judaism, Christianity and Islam have had very early roots. The Kebre Negest tells the story as follows: The Queen of Sheba (or Makeda, as she is known in Ethiopia), makes a trip to the court of Solomon, having been persuaded to visit the King who had a reputation for great wisdom and might. Once in Jerusalem, a great banquet was given in her honor, at the end of which, Solomon invited her to spend a night in his chambers. Makeda agreed, after extracting a commitment from the king that he would not take her by force. The king agreed, on the conditions that the queen make a promise not to take anything in his house. To this, she assented with confidence. However, having eaten so much seasoned and delicious food at the banquet, the queen was awoken by thirst and drank the water at the side of her bed. King Solomon, who had slept at the other end of the room - and had deliberately kept awake - then came over and accused her of having broken her oath, and then worked his will on her. The story has it that later that night, the king dreamt that a great light of brilliance the shekina, of the divine presence had left Israel and moved to Ethiopia. The Queen subsequently departed to her home country and there, nine months later, she gave birth to a son, Menelik who became the founder of the Solomonic dynasty in Ethiopia - of which Haile Selassie was the last monarch. When the boy had grown up, he went to visit his father - and was received with great honor and splendor. After sometime, the young man arose to return to his mother. Thereupon, his father assembled the elders of Israel and commanded them to send their first-born sons with Menelik. On departure, the young man and his retinue abducted the Ark of the Covenant, and took it with them to Ethiopia; which now became the second Zion. 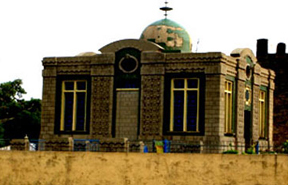 The story has been such an integral part of the Solominic state that the Ethiopian Orthodox Church today claims that the Church of Our Lady Mary of Zion in Axum harbors the biblical Ark of the Covenant which contains the Tablets of Law on which the Ten Commandments are inscribed. 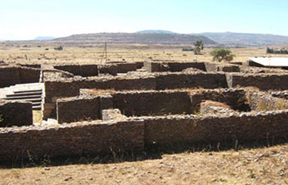 The church was the site where Ethiopian emperors have been crowned right down the centuries to Yohannes IV in 187. Axum is still considered the holiest city in Ethiopia. Among a whole series of religious holidays, the festival of Maryam Zion is still celebrated with great pomp on the 7th of January, every year.